WOW! The Waukee 4th of July parade was awesome – HUGE crowd, kids with grocery bags full of candy, and no rain! We were so glad we could participate again this year, and we have duly noted that we need to buy more candy for next year. As we were driving in the parade, it was great to hear comments like, “When are you coming to our neighborhood?” and “We love your service!”. The mi-fiber installation crews are continuing to build out the fiberhoods. We are going full speed ahead with installations in Fiberhoods D, C, and E! In Fiberhood B we are making great progress with boring in conduit, pulling fiber, and preparing to place the electronics. Fiberhood F is next on the list. We are working with the city to get our plans approved and will then start calling in locates. Be on the lookout for all the flags marking the existing underground utilities! 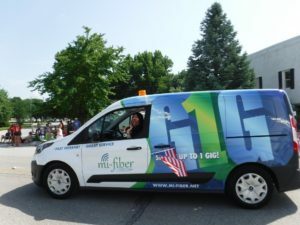 Make plans to attend the Waukee Arts Festival on Saturday, July 14 and stop by the mi-fiber booth (#92). We will be next to the Waukee Public Library. Mi-Fiber will have “freebie” items for the adults and activities for the kids. Hope to see your there!